Each jewelry item comes with a handcrafted JanetJewelry gift tag on the jewelry, along with cleaning instructions for the piece. 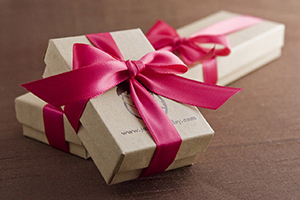 Each item on the janetjewelry website has 2 options for packaging: Standard (no box) or Gift Box. Our customized JanetJewelry gift boxes are made of 100% recycled cardboard, covered with 100% recycled paper. If you have MORE THAN ONE ITEM IN ONE ORDER, I will place a small yellow post-it note on the front, under the ribbon, which will tell you what item is inside the box. Don't forget to take it off before giving your box away! If you'd prefer for me to write a NAME on the yellow post-it note instead of the ITEM NAME, please email me or write a note for me on your ordering form, and I can do that for you. Inside the gift box: each item is carfully packaged in anti-tarnish tissue, and comes with cleaning/care instructions and a clear plastic zip top bag (for jewelry storage purposes). All domestic USA orders are mailed out in USPS Priority boxes (or Express, if that is your option), which I find to be very sturdy. NOTE FOR RING ORDERS: our ring boxes are PLAIN WHITE on the outside, white padded styrofoam on the inside. If you select "Gift Box" for your ring, it will come in our plain white ring box (not the brown craft color box above) with your choice of ribbon color. STANDARD PACKAGING (no box): this option was created after requests from our "Regular" customers, who already had many JanetJewelry gift boxes and preferred to have their jewelry sent to them without the JanetJewelry gift boxes. Each jewelry item is placed in a small clear plastic zip top bag, and comes with cleaning/care instructions. The item(s) are then placed in bubblewrap and mailed to you in the USPS Priority Mail box. Again, the "no box" refers only to the gift box(es)--your order will arrive to you protected inside the USPS Priority Mail box(Or Express, if that is your selection). Currently, we do not offer an envelope option for mailing purposes.